A moving, inspiring, personal look at the vastly changing world of wildlife on planet earth as a result of human incursion, and the crucial work of animal and bird preservation across the globe being done by scientists, field biologists, zoologists, environmentalists, and conservationists. From a longtime, much-admired activist, impassioned wildlife proponent and conservationist, former chairperson of the National Endowment for the Arts, four time Academy Award nominee, and Tony Award and two-time Emmy Award-winning actress. 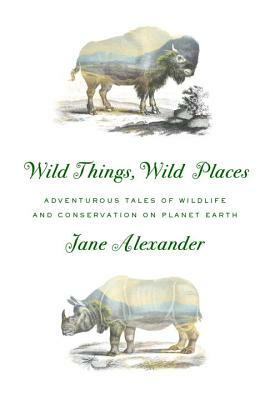 In Wild Things, Wild Places, Jane Alexander movingly, with a clear eye and a knowing, keen grasp of the issues and on what is being done in conservation and the worlds of science to help the planet's most endangered species to stay alive and thrive, writes of her steady and fervent immersion into the worlds of wildlife conservation, of her coming to know the scientists throughout the world--to her, the prophets in the wilderness--who are steeped in this work, of her travels with them--and on her own--to the most remote and forbidding areas of the world as they try to save many species, including ourselves. JANE ALEXANDER was born and raised in Brookline, Massachusetts, and attended Sarah Lawrence College and the University of Edinburgh. Alexander has appeared in sixty films for screen and television and was nominated for an Academy Award for her roles in The Great White Hope, All the President’s Men, Kramer vs. Kramer, and Testament. She received an Emmy Award for Playing for Time and Warm Springs. Her career in theater has taken her from Broadway to London’s West End. She is the recipient of a Tony Award and an Obie, and was inducted into the Theater Hall of Fame. Alexander was chairman of the National Endowment for the Arts from 1993 to 1997. She is a former trustee of the Wildlife Conservation Society and a commissioner of New York State Parks, Recreation and Historic Preservation and is on the board of the Audubon Society. Alexander was the recipient of the first Global Wildlife Ambassador Award given by the Indianapolis Prize. She lives in Nova Scotia and upstate New York.